PDF to Word OCR Converter can help you recognize text in selected pages of normal PDF and scanned PDF in Windows platforms. You can keep reading this article to know more details about it. Step1. After downloading installer of PDF to Word OCR Converter, please double click it in order to get setup wizard, then install PDF to Word OCR Converter step by step till the end. Step2. 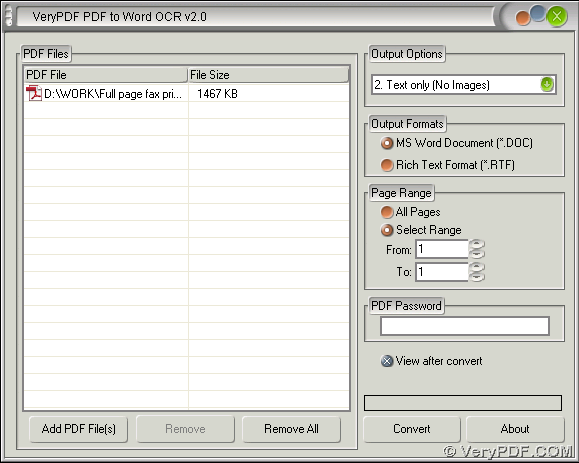 Add normal or scanned PDF file for this process: open PDF to Word OCR Converter > click “Add PDF Files” on interface of PDF to Word OCR Converter > select PDF file in dialog box of “PDF2Word” > click “Open” there, then normal or scanned PDF file can display as a path appearing in processing table. Step3. To recognize text from normal PDF file, please click “Text only (no images)” on dropdown list of “Output Options”; to realize it from scanned PDF file, please click one of “OCR PDF file (Language: …)” on dropdown list there, for instance, if language of scanned PDF file is Italian, please click “11. OCR PDF file (Language: Italian)” on dropdown list there. Step4. To get selected pages of normal and scanned PDF file, you may need to click radio of “Select Range” firstly, then type page numbers in edit boxes of “From” and “To” there. For instance, if you just want 1st page converted later, you need to type 1 in both of edit boxes there, which is essential to get continual selected pages of PDF file. Also if you want to preview targeting file automatically after conversion of PDF to Word, please click check box of “View after convert”, which is optional according to your will. Step5. To set targeting format, please click one of radios of “MS Word Document” and “Rich Text Format” on interface of PDF to Word OCR Converter in order to get DOC or RTF after conversion. Step6. 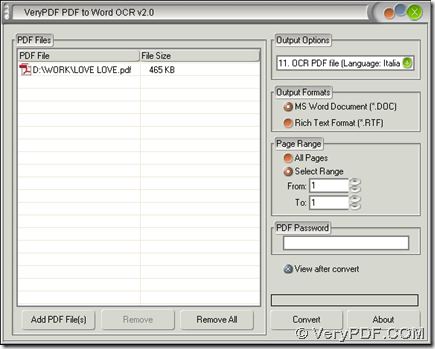 Click button of “Convert”, then you need to select a folder in dialog box of “Save As”, and click “Save” there, later on, PDF to Word OCR Converter can offer you perfect DOC or RTF file added in targeting folder on your computer automatically. Till now, if you still feel a little confused on PDF to Word OCR Converter and this process, which is to recognize text in selected pages PDF file from conversion of PDF to Word, you can go to official website of PDF to Word OCR Converter and leave your comment here, we will help you with this asap. This entry was posted in PDF to Word Converter and tagged PDF to Word, recognize text. Bookmark the permalink.